Gerstle: Will Boulder pay it forward or cash it in? 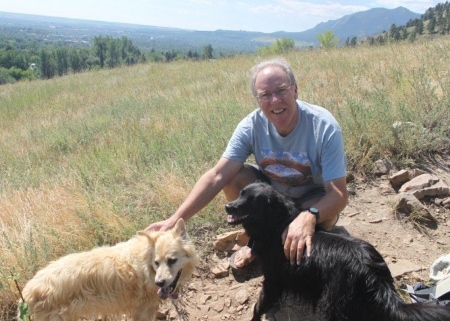 John Gerstle, a 2017 candidate for Boulder City Council, has lived here longer than any other candidate and saw some of the formative initiatives that shaped Boulder—including the Blue Line and Open Space—come to life in real time. He believes his bird’s eye view of local history makes him unique among this year’s candidates, but has a deep concern about Boulder’s future that helped him take the leap into running for office. “Over the past 60 or 70 years, or even longer, Boulder has developed this tradition of paying it forward, so that it’s willing to make investments and some sacrifices in present activities, for the benefit of future generations…I sense there’s been a change in the attitude, in which the city has been less willing to think of the future aspects of Boulder in the long term, and there’s been more pressure to allow profits in the short term,” said Gerstle. Gerstle arrived in Boulder at the age of six months, and has kept his official residency in Boulder since then, though he has lived in other temporary locations for periods of time. He said Boulder was a “delightful” area to grow up in with a different character than it has today—recalling a part-time job he had as a goat herder in the Mt. Sanitas area—while his parents Kurt and Eva Gerstle were involved in the citizen activism that contributed to the passage of the Blue Line and Open Space ballot initiatives. “I grew up with issues like those as the dinner-table conversations, even as a kid, and it certainly had an impact on my views as well,” said Gerstle. He attended local schools, then enrolled at the University of Colorado and earned a degree in Chemistry after switching majors several times, which led to experience working in labs at CU and a part-time job with a Denver water resources consulting firm. He then attended the Massachusetts Institute of Technology (MIT), and earned degrees in Water Resources and Environmental Engineering, and then returned to Boulder and taught a water resources management course before seizing on opportunities to bring his talents overseas. Gerstle joined a Norwegian firm to help them with consulting, which led to work on projects in Norway, Africa and Asia, including experience working on international river compacts. He then worked in Bhutan for three years as general advisor to its government, and then served as regional advisor on water and environmental issues in the Himalayas for the United Nations. He came back to Boulder, joining a water resources consulting firm in town, and today is an independent consultant, focusing on water rights and water resources management and allocation. His first formal Boulder public sector experience was with the Boulder County Mosquito Control Advisory Board, from 2003-07, which was an interesting time in mosquito control because of the West Nile Virus epidemic that hit Colorado in 2003. Gerstle then served two terms on the Boulder County Planning Commission, including time as its chair. He said some of the top issues from his Commission experience included work on the 2010 major update to the Boulder Valley Comprehensive Plan (BVCP), along with early issues surrounding fracking in the county—and he already had experience working with environmental organizations regarding limiting extractive industry activities in the vicinity of bodies of water. Gerstle also served for three years on the City of Boulder Planning Board, again working on a major update to the BVCP, this time in 2015, and again becoming the chair. However, at the end of his term in March this year, Gerstle was not re-appointed to the board by the Council, which was controversial and duly noted in local media. He said he believes the new Council that started after the 2015 election had a different attitude about the role of the Planning Board than the past Council, and maintains that Council did not notify him of any concerns about his work on the board. “My attitude had always been to consider the long-term benefit of the decisions we made for Boulder, in addition to ensuring the credibility of the Planning Board decisions, and following the written and unwritten rules and procedures of the Planning Board in decision-making,” said Gerstle. He is now making his second run for Council, after finishing eighth in 2013 with 8,112 votes, and said the political aspect of running in 2013 was an educational experience that he hopes will help him in the 2017 race. Gerstle supports moving ahead with the city’s effort to create a municipal electric utility, in part because Boulder has set environmental goals such as 100% renewable energy by 2030, and he believes the city can’t reach its goals without the muni. “I would say the alternatives are that we need to pour more into state level efforts to require more renewable power. But even if that were to succeed it is not clear to me that the city’s goals would be met. At the same time the city is moving ahead with a number of efforts on its climate goals, and I think that they have to continue and be given additional effort as well,” said Gerstle. While transportation solutions can help the city meet climate goals, Boulder is also suffering from regional transit challenges and local traffic congestion. Gerstle favors working toward a community-wide EcoPass program, noting that the current system is inefficient and often not available to those who need a pass the most. He also supports unbundling parking expenses from housing or employment, allowing those who don’t need parking to save money and incentivizing not owning or using a car. Also, he desires expansion of public transit, for example along corridors such as East Arapahoe, to entice more people to leave their cars at home. Boulder’s growth and housing challenges are once again top issues in 2017. Gerstle maintains that he is in favor of managed growth, not “no growth,” and believes the city should make sure new growth benefits the city to the greatest degree possible. Like many other candidates, he noted Boulder’s jobs-housing imbalance, and said the city should be deliberate about what types of new employment it attracts due to its impact on housing demand. To maintain affordability, he favors an increase in the commercial linkage fee that pays for new affordable housing. He also supports affordability incentives, and city purchases of properties to keep more affordable units in the city that are already built. However, he is fully aware that some of the housing costs are beyond the city’s control, including when investors who are not from Boulder own the properties. “Boulder is becoming a tremendous destination for real estate investors, and the people who are involved in that tend to be short-term owners and less concerned about the long-term benefits and values of the city. I hope to ensure that Boulder retains its pay-it-forward attitude,” said Gerstle. Gerstle is one of five candidates who received endorsements from PLAN-Boulder County, Together4Boulder, and Greater Gunbarrel. He also lists endorsements from Livable Boulder, Boulder Neighborhood Alliance, Martin Acres Neighborhood Association, Table Mesa Neighborhood Association, East Boulder Leadership Council, South East Boulder Neighborhood Association, Neighbors of 3303 Broadway, and Save South Boulder. As of Sept. 30, Gerstle has received $100 maximum donations from current Council members Sam Weaver and Lisa Morzel; former Council members Susan Osborne, Allyn Feinberg, Gwen Dooley, Steve Pomerance, and Crystal Gray; current Council candidates Mirabai Nagle and Cindy Carlisle, and others. Next Topic: Casas: A modern age—how about modern democracy?